Back when the oceans were pristine, oysters were a plentiful peasant food. They were often served in bars, where the salty little blobs whet the customers’ thirsts for another mug of ale. Today you get more cost-efficient bowls of peanuts and pretzels. This lead to a well-respected pairing of oysters and stout. Today the phrase "oyster stout" normally refers to stouts meant to be paired with oysters and shellfish, or occasionally ones that have a small quantity of ground oyster shell added to the boil water (to adjust the water's mineral profile). But every now and then, someone thinks, "why not brew with oysters?" This time, it was craft brewer Harpoon, situated in the seafood loving town of Boston, Mass. The beer didn't taste like oysters, or even smell much like oysters. The Harpoon website said the oyster bodies were added at the beginning of the boil. During the sixty minute boil, the oysters cooked and burst, slightly dissolving into the stout. I would imagine any remaining hard little knobs of cooked oyster were strained out in the beer's transfer to the aging tank. 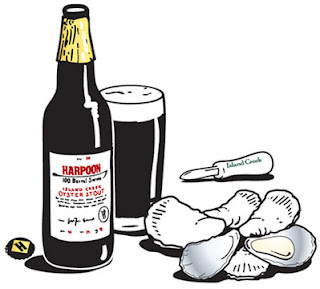 Harpoon said that the oysters were not added so much for flavor, but for the thickening proteins their dissolved bodies would add to the beer. It would be like a thick oatmeal stout, but more oyster-ry. The head brewer went on, explaining that she doesn't taste much of an oyster flavor, but that some people say it's all they can taste. Maybe it's in their heads, or perhaps they just got an errant piece of unfiltered oyster body. All in all, I liked this beer, but didn't notice anything spectacularly wild about it. It would be interesting to taste the same recipe of the beer without oysters next to the oyster-infused version to see how much thicker it actually tastes. In the future, it would be better to just treat myself to a nice plate of oysters and a stout, rather than this beer. It's a cool idea, but I'm not sure if they oyster juice is worth the squeeze.